Every acoustic keyboard instrument has 2 or 3 pedals, placed at bottom front of the instrument. 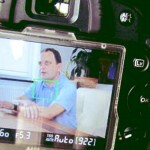 How do we use them and what are their functions? 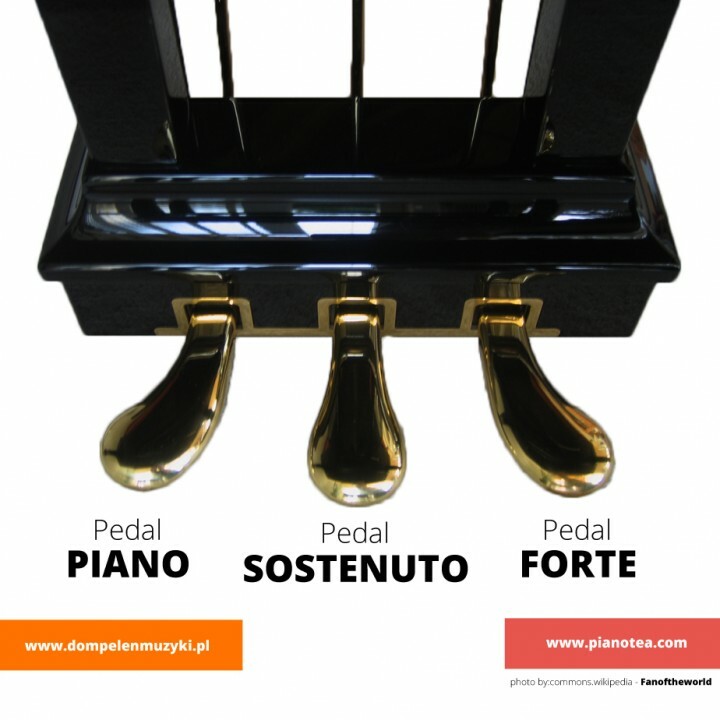 Right pedal, called also “forte” and in electronic keyboards – sustain pedal. This pedal is most often used. 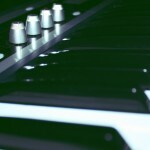 It’s function is to allow strings to vibrate freely even after a key on the keyboard has been released. The main task of this pedal is not to strengthen the sound but is used to harmonically connect and multiplying different sounds. Making the impression like there is more than one person playing. Left Pedal – una corda – one string. Also known as piano pedal. This pedal primarily modifies timbre and color of the tone, making it more delicate and soft. 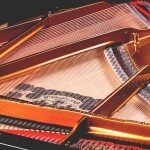 On the modern piano, pressing a left pedal makes the hammers of the treble section hit two strings instead of three. The action shifts slightly to the right and the hammer strikes fewer number of strings. 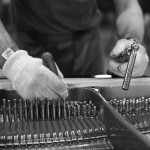 In upright pianos, una corda, is moving hammers towards strings. Since the hammers have less distance to travel this reduces the speed at which they hit the strings, and hence the volume is reduced. It has different role in different instruments. This pedal is often missing in older and cheaper instruments. When it’s present the functions are different. In grand pianos, sostenuto works similar to the right pedal. It sustains only those notes that are being held down when the pedal is depressed, allowing future notes played to be unaffected. On some upright pianos it makes the sound extremely quiet and it’s often called “neighbors friend”. Using the pedals of the instrument should be characterized by moderation and sense of genre and style. Often in pop music, pressing and letting go of the sustain pedal is connected with the harmony of the song, or the following change of chords. The general rule is that the pedal should be pressed to change the function of the chord, and let go just before another change. In classical music, which is characterized by the accuracy of the notes, the place where pedal are pressed is usually marked with a letter “P” and the place of it’s dismissal with a star “*”. 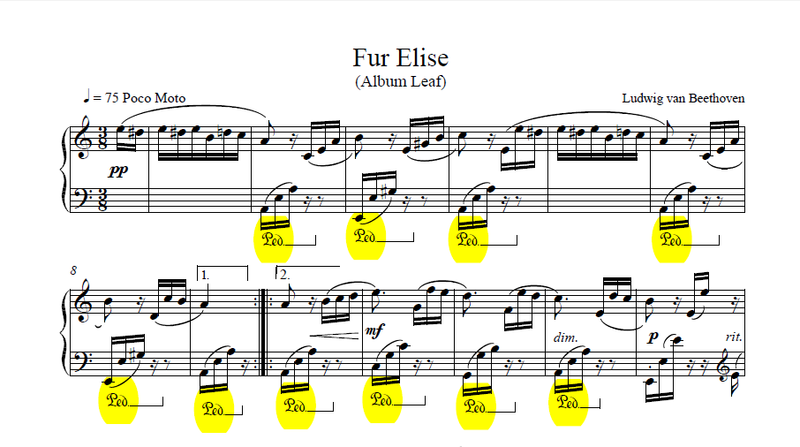 Here is the example of the initial part of the song “Für Elise” Lv Beethoven, with indications regarding the use of the damper pedal, or sustain pedal. In this case, the place pedal are marked as “Ped” and dismissal as the end of the horizontal line. Using pedals for beginners can be interesting but difficult. Using pedals from an early age is recommended, and it might be useful at the later stage for interesting tonal modification.